Meet Veronika from Veronika's Blushing. 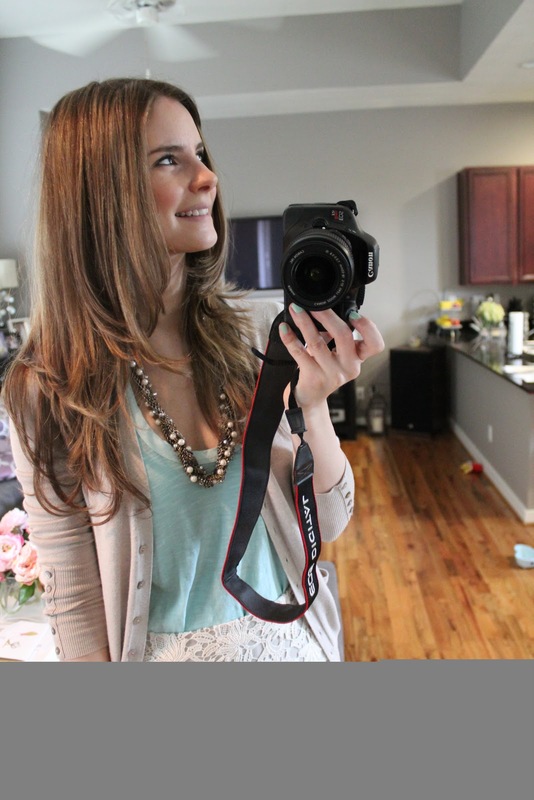 I am forever amazed by Veronika's versatility; she has amazingly great fashion tips, beauty tips, and decor posts. I am so excited that she was able to do this for me and I hope that y'all love her post just as much as I do! My name is Veronika and I'm a 28 year old fashion and beauty blogger based in Houston, Texas. I’ve always loved fashion, makeup, home décor and all things pretty and girly. I’m a semi-newlywed married to an incredible guy and we have a shi tzu-poodle mix named Lulu (he’s a boy). I love to shop (shopping is my cardio! ), am a product addict and love to share my latest beauty discoveries. I’m addicted to green tea (Starbucks "Zen", specifically), sour patch kids, butterfingers, skinny cow ice cream sandwiches and everything pink. In addition to working full time and blogging, I write freelance fashion, beauty and home decor articles for CultureMap & GalTime and I love attending fitness classes run by my awesome trainer. I also love to travel, spend time with family and friends and watch movies. I’m a little bit addicted to TV and reality shows. 1. I absolutely adore your style both with home décor and in your clothing. How would you describe your style and what are your beauty/style icons? Thank you! I'm a girly girl. I love being a woman and wearing dresses and skirts and bows and lace. I love outfits that exude femininity but are also polished enough for the workplace. As far as celebrities, a few who come to mind are Lauren Conrad, Kate Beckinsale, Kate Middleton, Victoria Beckham, Audrina Patridge and Blake Lively. Truthfully though, I'm most inspired by other bloggers. I love seeing real women shop in the stores that I shop in and styling outfits for everyday life. 2. It seems that your OOTD have a great mix of higher priced brands with extremely affordable brands, do you spend a lot of time shopping/searching for these finds or does this come naturally to you? * Sign up for RueLaLa, MyHabit, Gilt Group...all designer discount sites! I got a Cynthia Vincent dress a month ago that was originally over $350 for $70! 3. An aspect that I love about your blog is your focus on fitness. How often do you hit the gym and what is your favorite go-to work-out? Anything you’ve wanted to try out recently? I try to work out 5 days a week. Sometimes I can only do 4 days and sometimes I can squeeze in 6 because we have a class every other Saturday (regularly it's M-F). My husband and I take a bootcamp class together that's run by my former personal trainer and we really enjoy it. It's a great way to spend time together and to do something great for our bodies. I also have several friends who take the classes so it's kind of a post-work social hour in addition to a great workout. 4. On to beauty (and one of my fave topics) What are your must have beauty products and why? Oh my gosh there are SO many! Once a product gains holy grail status, I am devout to it and use it daily. I do my makeup the same way every single day (sometimes I'll change up the color of my eyeliner or blush). I have been branching out a little more lately. Thanks to great return policies at Sephora and drugstores, I can try more products knowing I can return them if they don't work out for me. - MAC fluidline gel liner in "dipdown"
- MAC dazzleglass "baby sparks"
5. You are so open and forthcoming about all of your beauty routines (and being a fellow routine-oriented individual I completely appreciate them). How did you come up with all of them? Was it a lot of trial and error or did you just happen into them on your own? That's a great question. My routines have evolved over time and it kind of happens progressively. I'll try something (like switching to using eyeshadow to line my lower lash line instead of gel liner) and it just sticks! It's kind of like "how else can I get this same look, but using a different product?" I loved how using eyeshadow created a softer line on my lower lashes and so I said bye bye to using gel liner and now only use the gel on my upper lashes. There are a lot of women out there who love to wear different color eye shadows and blushes and lip colors. I applaud them because it takes a lot of time and effort. I kind of operate by the "find your signature look and stick to it" philosophy. It takes me less than 10 minutes, it's easy to do and it makes me look polished and put-together. Knowing what works for you and how to make yourself look how you want to is a powerful thing. Once you've got a routine down, it becomes a pretty awesome thing. Sometimes, I wish I was more daring with my hair and my makeup, but at the same time, I like knowing that my routine makes me happy and makes me feel ready to take on the day. As far as hair routines---that's where there was a lot of trial and error for me. I spent a lot of my younger years experimenting with color and extensions and all kinds of crazy-ness, so when I finally got my hair to a place where I knew I was going to keep it that way for awhile, I had to learn to style it. Now, I blowout my hair twice a week and set it in Velcro rollers and then I curl it a few days a week with a curling iron. It works for me and allows me to have a little variety. Just like my makeup though, I tend to stick with the same hair looks too. I also go through phases. In 2007---I was all about "the pouff" (where you pin back the front part of your hair in a "pouff"). I wore it like that every day for over a year. The next year, it was all about the side part. I did a deep side part with a pin on the side for nearly a year. The year after that, it was all about the random part with the front right piece of my hair pinned to the side with a bobby pin (to keep it out of my face). Now, I'm all about the middle part with my hair all down. 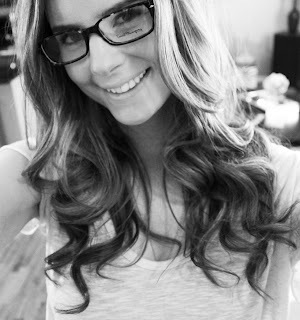 I think curling my hair helped me "train" it to go more away from my face, since it naturally grows forward. I kind of like what I have going on now with my hair, so it will probably stay that way for a couple of years...though given my history, it could go "kapoof!" six months from now. 6. Is there anything that you are currently lusting after right now? 7. What are three things you couldn’t live without? This one's easy! My husband, my dog and friends and family. Things are nice, but people and pets are awesome on a much deeper level. I also am not sure I could live without sweets and candy. I love sweets SO much. Thanks again Veronika! Please be sure to check out her blog﻿ and follow her on Twitter.